Killer Characters: Family is everything! HAVE A COZY CHRISTMAS #GIVEAWAY CONTINUES. Holidays mean so much to me. I love spending time with my grandparents, my newphew, his girls, my friends. But I can do that any time. We all live in the same town. What I love about the holidays are the traditions. Not only the decorations and the songs, but the food. At Christmas, we have always served a meal that warms my heart. Roast beef, Yorkshire pudding, green beans drenched in warm butter, and an assortment of desserts. I enjoy this meal so much, that I actually decided to serve it early this year. In October. Why? My friend Meredith is getting married to my cousin Matthew, and she asked me to help her put together a menu for the occasion. So I thought that, on the night when we would taste test desserts, we might as well feel as though we're having a pre-celebration, right? That's why I cooked up my favorite meal. For Clair, my niece who is a celiac, I made gluten-free Yorkshire pudding popovers. She was so excited. You should have heard the satisfied oohs and aahs. My sweetheart, Jordan, who helped me wash dishes before we set out dessert, said it was the best meal he had ever had. I doubt that. He's a cheese farmer now, but he used to be a chef and can cook rings around me. We met in a cooking class at one of the adorable restaurants in Providence. Anyway, for dessert, I dreamed up some mini-tarts, a variety of cheesecakes (of course), and Brie blueberry ice cream. Delish. I think we're going to serve all of them at the wedding. Won't that be fun? What do you serve for the holidays? What's your favorite all-time meal? HAVE A COZY CHRISTMAS GIVEAWAY. 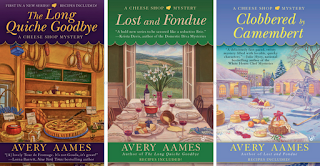 For today's Cozy Christmas Giveaway, I'm awarding a copy of YOUR CHOICE of the first three CHEESE SHOP MYSTERIES to one person who comments on today's post. Check the sidebar tomorrow to see if you've won!!! I usually make pumpkin pie and whatever desserts need making for our family Christmas celebration. I think the Thanksgiving and Christmas Eve meals we have are the best and can't wait for them all year. Kimberlee, I like the "eve" meal, too. So much anticipation. And the aromas. Aren't they wonderful? Mariska, ooh, Double chocolate Brownies. Which chocolate do you use? I happen to love Hershey's Kisses (though I wouldn't make brownies with them - one at a time - they're like little packages with bows). My mother's favorite. Yorshire pudding and roast beef with pink salad is my most favorite meal. In the past recent years we've been doing an all day buffet and or a different meat at Christmas, instead of just the turkey and we've thoroughly enjoyed them all! So guess it's the person your celebrating with that really makes the holiday! Thanks and Merry Christmas to you and the ones you love! I adore Yorkshire pudding. What is pink salad? I'm not familiar. I can't imagine an all-day buffet. Wow! But yes, family or friends. It does matter, doesn't it. Hope there's laughter. Being of Czech origin, besides the usual roast turkey or perhaps a ham, our holiday meal always includes potato dumplings with gravy and sauerkraut. Pumpkin pie is always on the menu, though for our son in law who does not like pumpkin or fruit pie, a chocolate pie is now included. Dianne, potato dumplings with gravy and sauerkraut. What a savory combo. Sounds fun and filling! And isn't it amazing what one will do for in-laws? But at least he likes chocolate. As a girl I used to make chocolate pudding pie in a graham cracker shell with lots of whipped cream and chocolate chips on top. Double-yum. i always make deviled eggs. they are my fav. Toni, I like deviled eggs. Do you dust them with paprika? So festive and such a tasty tiny morsel packed with protein. Last year I discovered a new holiday favorite - peppermint chocolate cake balls. Oh, Booklady, yoo-hoo! I want that recipe please. They sound like so much fun!! I'm thinking of making peppermint chocolate candy bark. It's very simple. Just bake a chocolate cake (from scratch or a mix). Let it cool and then crumble it. Mix with about 2/3 can of peppermint frosting (since they only sell it during the holidays, I try to stock up in case I get a craving during the summer.) Form into balls and chill. You can either frost them or leave them plain. If you ware talented (which I'm not) you can form them into shapes and/or put them on a stick to make cake pops. I usually just pour some warm chocolate glaze over them and then chill again. They never last long and taste like a York Peppermint Pattie. I'm making two batches this week for two different Christmas parties. One of my favorite recipes and not to hard to make gluten free if necessary. Oooh, yum! Thanks. Sounds fabulous. Maybe I'll get the twins involved. Angela, that sounds so lovely and easy. You know how much I love cheese, don't you? (Wink). I bet the kids like the ease of it, too. No veggies for a night. Whee. Ham and egg nog. Yes, those are some favorites. Do you lace the egg nog? Grandmere likes to slip in a little brandy. Not for the twins, of course. We don't do anything special for our holiday meal, but I must have pumpkin pie with whipped cream. Like Garfield, my all-time favorite meal would be lasagna. happy holidays to all, the books like awesome! what we serve for Christmas dinner is easy, first to his sisters for a turkey sit down, then to my brothers for a lobster supper. we are lucky to live so close to most of the relatives and are able to see many of them on this day. a traditional new england clam boil was really good, out of season last year but lobster would be my favorite. J, lobster on Christmas sounds so elegant! Wow! We couldn't do that in Ohio, for sure. I happen to know my author, Avery, is making a lobster soup for New Years. How nice for you to have so many family nearby. I love that about my own family in Providence. For the past eight years we've host my husband's mom and siblings/spouses/nieces for Christmas Eve brunch. One of the standards that I've made every year is cream cheese danish. One of the simpler things on the menu, but one of the favorites too. Christmas coffee cake is a must for Christmas morning. I now use frozen bread dough instead of starting from scratch. A precursor to monkey bread. Karen, I adore coffee cake and know just the kind you mean starting with the dough. I wonder if I could make that gluten-free for my "niece". Think I'll try. Smoked salmon, fresh green beans, eggnog (spiced with rum), apple pie with rum sauce after dinner with coffee/tea. Jake, what an eclectic combination. Like a smorgasbord! The rum sauce sounds fabulous on apple pie. Mmmmm. I like apple pie with a slice of cheese. I've also been known to make an apple pie where the top is grated cheese and makes a cheese "crust." The only thing that MUST be served is the green bean casserole! Everything else is negotiable. Kim, we do the green bean casserole for Thanksgiving. I know what you mean! I'm serving ham, scalloped potatoes and vegetables. I don't think the food is very important, I just want to be around my family. Ooh. I want that recipe! Mary Jane, how lovely to see you! You got it. My favorite all time meal is a summer one - Fried softcrab sandwich with fresh tomatoes and an ear of fresh picked silver queen corn. For the holidays I look forward to the cookies! Aha, Susie, you're a sneak. You slipped in an out of season meal. But that sounds delish. One of my favorite, too. Cookies are always a favorite. Did you know one of the authors from this blog has a cookie contest going on - Mystery Lovers Kitchen, Krista Davis. She writes about Sophie in the Domestic Diva mysteries. Maybe you should enter? Favorite Holiday meal is ham, green bean casserole, black-eye peas (for good luck in new year), and blueberry muffins. For dessert we have pumpkin pie with whipped cream. Anonymous, sounds like a real southern meal. Now, tell me, why are black-eye peas good luck? Maybe I could start making them. Is there a trick? I have not read this author yet but I am always looking to expand my TBR (to be read) list. Lovely post thank you. I am very lucky, I don't have to cook, my father cooks for the whole family. But I do love Venison dishes especially. And we have different kinds of icecream and pudding for dessert, but always storebought. I love Chex Mix, I have to go make some now! 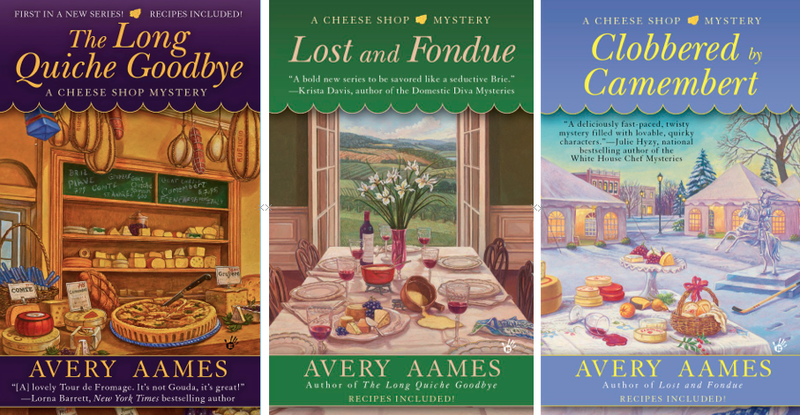 I am not familiar with these books but anything that combines mystery with food has to be fabulous. I am definitely adding these to my must read list! My household is grain-free and sugar-free so we don't really eat a "traditional" Christmas dinner but it is similar. Our holiday menu consists of an organic turkey, cashew stuffing, green beans almandine, mashed cauliflower, gluten-free sweet potato casserole with gluten-free pumpkin pie and cheesecake. I would love to try the GF yorkshire pudding popovers. Yorkshire pudding with roast beef--delish! This year we are having steak and twice-baked potatoes, something different for us. I also will make a pumpkin pie, fudge and different types of cookies. This is a special Christmas for me and my family. We have been separated by work for three years and we are now together again and close to our son and grandchildren. This series is a fun read--I love how she has expanded the shop and includes descriptions of merchandise and gift ideas. Similar to your dinner our traditional Christmas is prime rib with yorkshire pudding. For dessert we have buttermilk pie from a recipe that is at least 4 generations behind me! Wow, the above comment about prime rib and yorkshire pudding sounds real good. My favorite meal includes anything with bacon, however. It doesn't matter whether it's a holiday. In fact, I smell some now. I am trying out various cheeses. I like the hard ones the best. Haven't even tried brie yet. Maybe the book would influence this choice. Since I found out I was part Swiss, I've become partial to Swiss cheese, but I must have a bit of the Irish because I love Dubliner. Please put me in the draw. Thanks. It truly depends on what is being served as to what I would pick as my favorite. Our menu changes from year to year. I do love chicken and dumplings (or noodles). This year I took a class called Stocking Up for the Holidays and we made by hand: Hot Buttered Biscuits, Egg Noodles, a Pumpkin roll and a Sweet Onion dip. I cannot wait for my family to try them. They are in my freezer awaiting the Christmas dinner. YUM!!! My favorite all time meal would have to be pizza. I am hoping to make my own homemade crust and have my kids put the toppings on it. It will save us so much money and be healthier for us. Our favorite Christmas dinner is a picnic - potato salad, ham, etc. Because Thanksgiving has been a recent big day with a big meal, several years ago I had the idea to change everything to a picnic. My family enjoys it. Yum, I'm getting holiday menu ideas as I read. The favored dessert depends on who is there. There's chilled pumpkin pie with pecans and whipped cream, warm mince pie, shoo-fly pie, lemon meringue, and cookies: sand tarts and snickerdoodles head the list. I always enjoy lasagna and always love to have cheesecake for dessert! I love to have ham for christmas and pumpkin pie for dessert. Can't wait for this christmas to have my moms ham. Wow, I step away from the computer for a short while, and look at all the responses. Hi, all! What a collection of yummy sounding food. Cashew dressing. Seven layer cake. Sweet onion dip. Strawberry trifle. Shoo-fly pie. A picnic. Chex mix. I think we should all have a post Christmas party. Come to Providence and visit The Cheese Shop, okay? My husband makes Yorkshire pudding to go with our beef roast. I also make homemade caramel corn. Yummy! Deserts are the jewel at the end of the holiday meal----and I always have to try ALL of them. That's what makes the holidays so much fun. my favorite all-time meal is for the holidays is roast beef & pasta!!! YUMZ!!!! 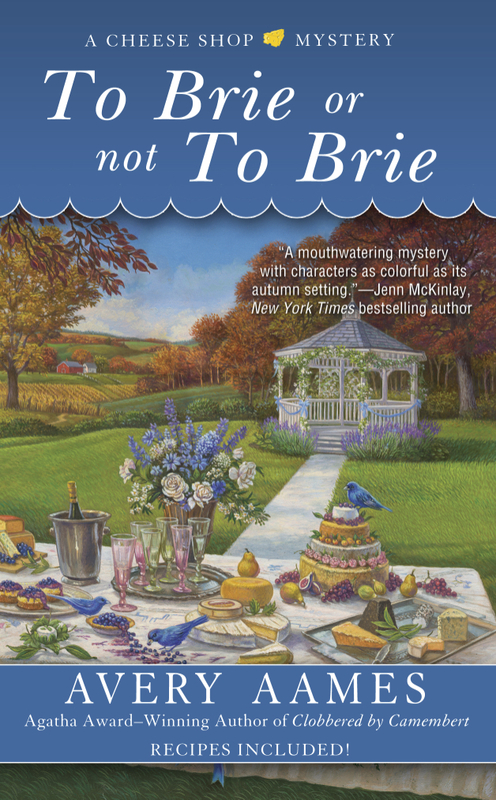 My daughter loves cozy mystery's so I have to try to win one for her. Thank you for hosting this contest. We serve turkey. I like potatoes. We like to have a fun Christmas Eve dinner, that is casual and simple. Lots of appetizers and sometimes fondue! We serve ham on Christmas day with lots of appetizers. Thanks for the giveaway. My hubby cooks either ham or turkey. My favorite meal is pot roast withe potatoes and carrots and of course some gravy. MMMMMMMMMMM Thanks for the giveaway. I am so excited to read these books. As its a new series to me I would hope to win the first one. My favorite traditional food was my Moms family pumpkin pie receipe that dates back to the 1600's! Plu her homemade fuit cake with real randy hard sauce was divine. I make my rum cake for the holidays and my brother in law seems to disappear with it every time :) I also love making squash and my family devours it. Each year, my mother and I, we get together to make a "Tuffles Porto" pie, (called "ragout de pattes de cochon" in French). Followed by my mother's unique apple pie recipe. My all-time favorite favorite meal, I have to say, is Parmigiana chicken. Thank you, and Happy Holidays to everyone! I agree about the traditions. They are very important. Since Christmas is during our Australian Summer we tend to eat a lot of salads & fruit. The 'Christmas' fruit is divine - mangoes, watermelon, peaches, cherries etc. My favourite meal has to be a roast lamb dinner with all the fixings. i love to bake (or make) and share anything sweet with the people i love. i joke that i don't have one sweet tooth...they all are! Every Christmas we have our home made polish sausage. For Christmas, if we were having company, we would make a dinner similar to Thanksgiving. For years, my father wanted oyster stuffing for the turkey and my mother wanted giblet stuffing. Finally a compromise was reached and we no long had any holiday menu arguments. We had oyster-giblet stuffing! My all time favorite meal was my birthday meal: stuffed green peppers, mashed potatoes, salad, asparagus and lemon meringue pie instead of cake. My favorite meal is of course the turkey & ham that we have for the holidays. I usually fix a cheesecake, mac n cheese, cream potatoes. My favorite item that is served at the holidays (and no other time) is my grandmothers Apple Walnut Cake- yum! I am always looking for new recipes and new books!